Pattern Row 1 - 3ch, 1tr into next tr, * 1ch, miss 1tr, 1tr into next tr, * rpt from * to * to last 2tr and 3ch to turn with, make 1ch, miss tr, 1tr into tr and top of 3ch. Turn. Rpt Pattern Rows 1 & 2 twice, Rpt Pattern Row 1 once, you should have 8 rows worked in all from beginning. Fasten off. Turn. Brim - Working through back loop of stitch only make 3ch, 1dc into base of 3ch, * miss 1dc, work (1tr, 1dc) into next dc, * rpt from * to * to end. Turn. Next Row - 3ch, 1dc into base of 3ch, * miss 1tr, work (1tr, 1dc) into next dc, * rpt from * to * to end. Turn. Join side seams, turn through to RS. Neck Edging - With colour 1, work one row of tr's evenly into row ends along neck edge catching in brim as you go. Fasten off. Finishing - Weave in any loose ends of yarn and trim. Thread chain tie through alternate tr’s along neck edge of bonnet and tie in a bow. 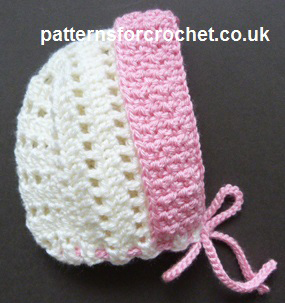 Hope you enjoy this free baby crochet pattern for a brimmed bonnet.